We had not applied for any visas before setting off from the UK and Burma was no exception. We therefore got our visa on the road. 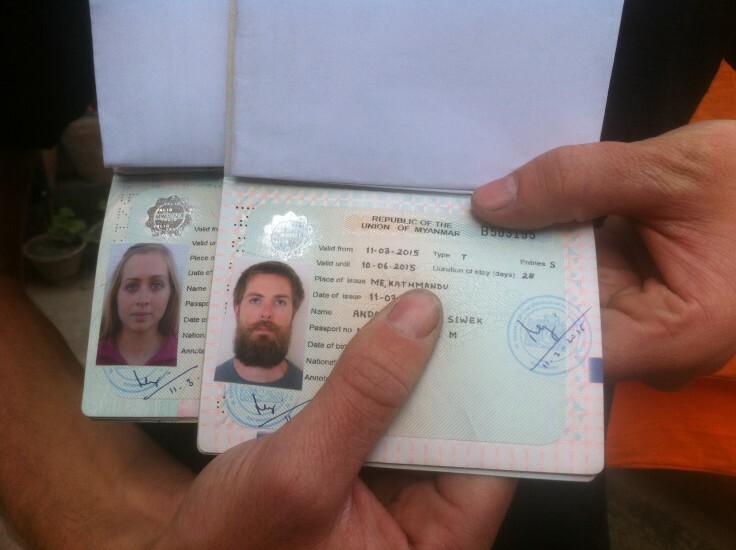 We ended up getting our visa in Kathmandu. It was a 28 day visa valid for three months from the date of issue. This is the longest visa we have heard of anyone getting issued. Do not trust where google maps says the Burma embassy is on google maps! It is located south of the ring road on Ekantakuna-Tikabhairab Rd on the west side of the road. Look out for the flag above the building. Ring to check their opening hours and requirements, it’s a bit out of the way so you won’t want to go back too many times if you don’t have to. The visa cost was $20 USD (bring crisp, new unmarked notes), three passport sized colour photos, and a pen to fill out the form. Drop it all off and two days later you will have a visa in your passport. We tried to get our visa in Delhi and failed miserably. After over 8 weeks of communicating with the embassy in Delhi, providing copies of itineraries, photos of our bicycles, copies of passports, visas and all kinds of other info, the visa officers at the embassy would not even come speak to us when we went to the embassy. Do not bother. Some other people who we met got their visas issued in Calcutta and were issued it fairly quickly. Some advice. Avoid going into specifics about how you are entering the country. Bring copies of your visa for India and copies of your passport. To enter by land into Burma ‘apparently’ you need special permission to do so. With a motorized vehicle it seems that you do for sure, as you will be accompanied by a guide (which you will pay for) and they will usher you through the country fairly quickly. By bicycle you have a bit more freedom and it’s a bit hit and miss on how much freedom you get (more on that in a minute). To be honest we are confused and in two minds about the special permission. We cannot decide if it is necessary or not. We don’t want to perpetuate the rumour/myth that you definitely need the special permission as we did hear of one tourer who crossed very early in the morning without paying it, he had applied and they had sent him email confirmation which he showed the guards and then he crossed without paying the $100 – which he was very happy about! Another cyclist who was in the country before us was stopped by the police and showed them the special permission. They didn’t care about it at all. He had to go back 85km to where he started his day because he had cycled into an area where there were no hotels. We felt that it all seemed a little strange with phone calls to a guy that showed up and took $100 from us each for special permission that had been ‘arranged’ for us. However, we never received any documents for that money and we never got asked about the special permission once we had crossed the border. We got the impression the guards were in on the deal and perhaps even got a kick back from the tour operator – this is all speculation though. On the other hand, every single cycle tourer that we spoke to who crossed from India to Burma had been in contact with one particular travel agency in Burma and had obtained special permission. We cannot know for sure if we would have been allowed to cross the border without it so we are staying neutral and just presenting the information for you to make your own mind up about. We won’t write the name of the company here because after using their services we are not convinced that it is something that is required, and all tourers seem to be passing around their info and name. If you want their details drop us an email and we will provide it. Camping is not allowed in Burma. Staying with locals as a foreigner is not allowed. You should be sleeping in a hotel, and be paying a lot of money for that hotel so the government gets it’s cut. But don’t fear it isn’t such a hard fast rule and if you are staying off the beaten track you can avoid paying for hotels altogether during your time in Burma. We camped a few times in forests and off the road. This was always well off the beaten track and followed the usual wild camping etiquette. Avoid being able to see the road, and people on the road seeing you. Make camp late in the day. Don’t make a fire, play loud music or draw unnecessary attention to yourself. In Burma we stayed in Monasteries often. They were always welcoming, kind and friendly. We often had a place inside a building, so protected from rain. We also got the chance to have a wash and there was a toilet. We always arrived late in the day just before sunset. We also did our best to respect the monks privacy and customs. Monks can only consume food between dawn and midday, so on occasion cooking after sunset was a no-no, however most places didn’t care if we ate, they just didn’t partake. We tried to arrive having already eaten when possible. We would also leave early in the morning, apart from being the best time to cycle in the day it was also when the monks would wake up. We also stayed with a family on our first night in the country and a mother and her daughter in the middle of the country in the woods somewhere. In the first case our stay was okayed by the village head. There will be cases when you will be so far from a hotel that you have no choice but to sleep where you are. And unless you get REALLY unlucky and forced into a truck like a guy we met who cycled through Burma, your stay with a family will and should be okayed with the village head. We stayed in hotels as little as we could. But we couldn’t avoid a hotel in Bagan (although we didn’t try a Monastery) and in Yangon. Hotels arereally expensive in comparison to other SE Asian countries. $25 dollars is around the cheapest that you will find, and it will be basic. We were followed by a low budget ‘spy’ on our first two days of cycling in the country. He followed us on his moped very slowly and it was pretty obvious what was going on. When we stopped for the evening at a church he tried to put the kibosh on us staying there. We heard of a string of spies on the road following tourers, following them until they reached the end of their district only to be met by a new tail when they entered a new jurisdiction. One guy we heard about even hid himself and his bike in the hopper (big scooper on the front) of a JCB to shake his tail! We spoke to some people who evaded these fellows. Luckily when we headed to more remote areas we didn’t seem to have anybody else following us. Just so you know, they were plain clothed and looked like everyone else. They can be anyone! The roads in Burma varied greatly from location to location. In general the roads were fairly rough and bumpy when paved. We were on gravel roads a few times and some sand roads in the teak forests. However, one thing that Burma has got right is the roads were often tree lined with big mango trees or beautiful flowering trees. It was really pleasant not only because of how beautiful it was but the trees also provided some very welcome and well-needed shade. Taking a train is fairly easy to do in Burma but bumpy. We took one train from the middle of nowhere to Yangon and it cost us next to nothing. A 450km journey from Taungdwingyi to Yangon cost us 4,300 Kyat (£2.50) for one ticket. Each bicycle cost around 2,500 Kyat (£1.40) and is based on weight, but we think that the baggage man pocketed that and also over charged us. 🙂 The train is slow; it took about 13 hours to do 450km. Don’t expect comfort from the train journey. Seats are tiny so hope you don’t have a neighbour for your entire journey. Bring a pillow, and even a roll mat if you are tall so you can sleep on the floor – all the locals were doing it! You aren’t supposed to bring Burmese Kyat in or out of the country. Not an issue for us as we usually withdraw money from ATMs. Be warned ATMs that say 24 hours do not dispense money on Sunday. If you stay in a hotel they will ask for US dollars. Make sure you have US dollars that are undamaged and without marks. It is probably easier to get US dollars before you enter the country if possible. Have had a look at all your Burma info and its a good read. The police presence makes me nervous though. The crossing by land from India doesn’t seem to work. I’d love to read that part. You must’ve already had all your visas before applying for that permit. You find this site interesting, if you haven’t already seen it. 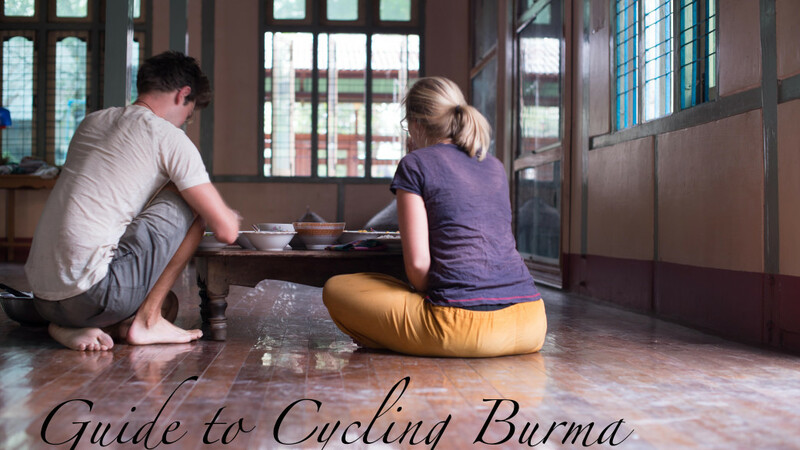 Thank you for the Myanmar cycling report and information! Good news on the Myanmar Embassy in New Delhi. I got a visa after writing a request letter stating that I would be entering on a bicycle at Moreh and exiting at Mae Sot. The normal requirements of hotel bookings and flight reservations weren’t needed. Cost was Rs. 1200 and visa was ready next day. Coincidentally another cyclist picked up his visa the same day. The official gave me a thumbs up. Any news about whether a permit is really needed at the Moreh border? Thanks for letting us know about your success in Delhi! Great to hear that you had more luck than us. Sadly no news about permit requirements at the Moreh border. But we would be happy to hear how you get on. Hope you are enjoying the road still! I have just (December 2015) cycled Pyay in central Myanmar to Kohima in Nagaland. I had a permit and it was checked thoroughly at the border but nowhere else. Immigration police did take me from a monastery to a hotel (10km) one night but were totally friendly and courteous. Most people (you will meet others) who bike the direct road from Monywa to Kaleywa report horrendous road conditions in the dry and impassable roads in the wet. I went via Gangaw which is longer but is surfaced all the way and is a nice ride. The 90km stretch east of Gangaw and 30km north of Gangaw are hilly with gradients sometimes 12% but no single climb of more than about 400mtr. There is a cheap hotel in Gangaw. You could probably sleep at Pale, Kyaw and Myaung Khin San. It is fairly remote and I didn’t see any immigration police in this area. Thanks for the up to date info, hopefully it will help out others planning to cycle through Burma! Thanks for sharing this guys! Well written and definitely useful for us! Ps- cycling Myanmar during water festival is definitely worth cycling in the hottest month! Amazing fun! Thanks for the update! It’s a real shame to hear that someone got turned back at the border, especially after making it so far. Hopefully this is helpful info for others reading the article. 1) in what countries, and cities in these countries (and by what address in each city) can i take permit to cross myanmar border zone? 2) how much does permit cost? how much day should i wait it? and how long does is it valid? 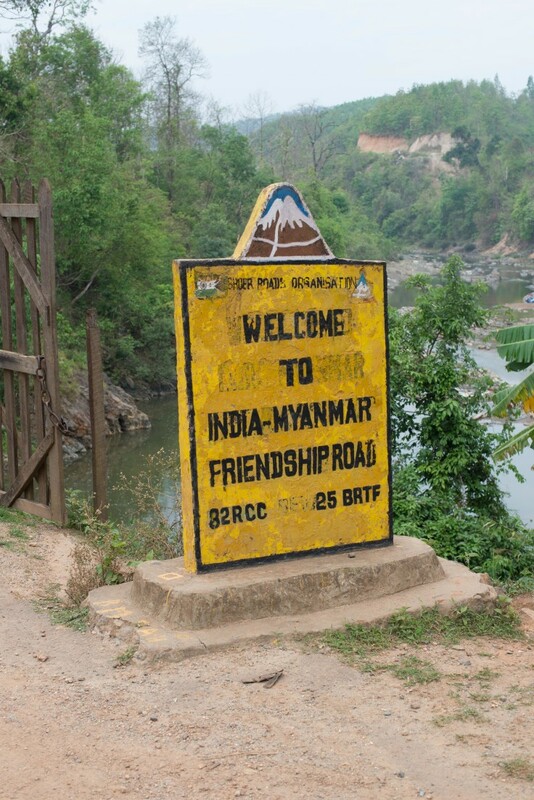 When we crossed in Burma the only place you could cross from was at Moreh. The permit will be prepared ahead of time, and you should bring a copy which will be emailed to you. To arrange the permit you will have to do it ahead of time, with a travel agent, the permit is not made at a government office. The permit costs either $100 or $50 USD and will last as long as your visa is vaild (which you will have to arrange separately. My partner Kate visited the Burmese embassy in Kathmandu this morning and was told in no uncertain terms that without a letter of invitation and an itinerary from a registered tour operator then they wouldn’t issue a visa to cross a land border. Alternatively we could provide plane tickets. We plan to enter from India in December. When she suggested that others had entered without such documentation she was met with the response ‘Well that was then and this is now. Rules change’. Most unhelpful. Adam, thanks for the updated information. Really helpful for those planning on making this crossing. Let us know how Kate overcame this challenge. I want to cross Myanmar from India and go out in Thailand begin of June this year. Is it possible, don’t want to be send back to India. Hope anybody has information. Currently I’m in Nepal for couple months and could arrange visa here. 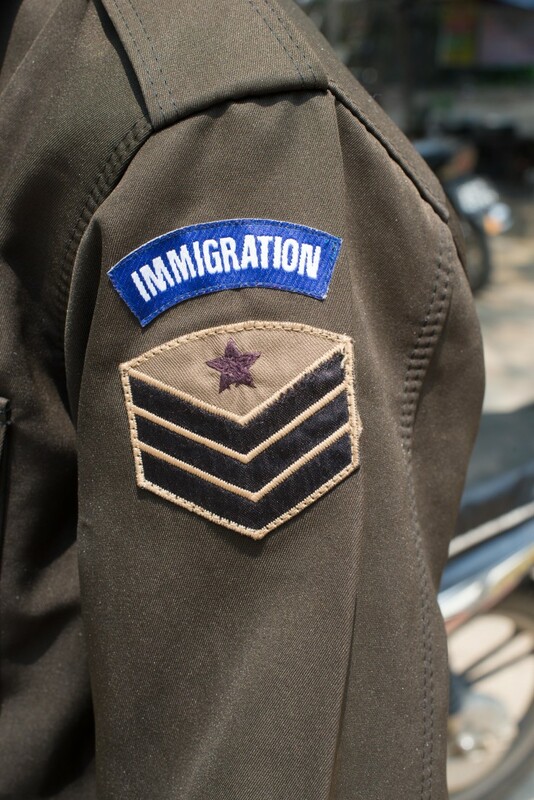 I’ve been in touch with several tour agencies and currently you are not allowed to exit or enter different border crossings without your own vehicle (car or motorbike) and even then you have to pay for guides which run into hundreds or thousands of dollars. However some people on this forum (https://www.warmshowers.org/node/173409k) think the rules could change back to the old ones as early as April. Just a quick note to say thanks for spending the time to put this together. It’s so valuable to have this kind of first-hand account and advice.